From the early days of colonial rule in India, the British established a two-tier system of legal administration. Matters deemed secular were subject to British legal norms, while suits relating to the family were adjudicated according to Hindu or Muslim law, known as personal law. 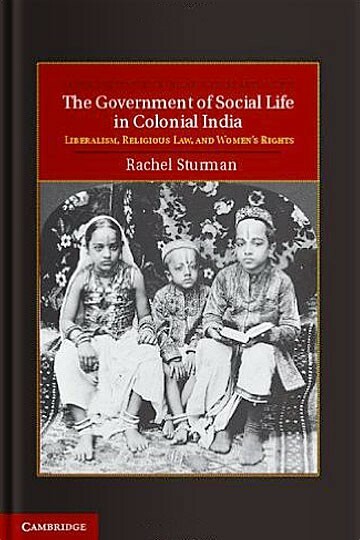 This important new study analyzes the system of personal law in colonial India through a reexamination of women’s rights. Focusing on Hindu law in western India, it challenges existing scholarship, showing how – far from being a system based on traditional values – Hindu law was developed around ideas of liberalism, and that this framework encouraged questions about equality, women’s rights, the significance of bodily difference, and more broadly the relationship between state and society. Rich in archival sources, wide-ranging, and theoretically informed, the book illuminates how personal law came to function as an organizing principle of colonial governance and of nationalist political imaginations.